Hey, Jude, don’t make it bad. Recently I wrote something called “Interruptions,” reflecting on the continuous drumbeat of tragic stories that emerge from the daily news. Every day, it seems, we hear another new piece of bad news piled on top of the unraveling stories of bad news from previous days. I read “Interruptions” in public at The Whistlestop Writers meeting here in the Tri-Valley. From the reaction, it seemed to have resonated with members of the audience. However, on reflection, I think even my central question — “What should I do about it?” — only made us feel worse about the things happening in our world these days. Gretta asked me, and I had to ask myself, “Was it a good thing to inflict such thoughts of harm and futility on my audience? Were they any better for it? Was I? Or did I just contribute to how bad we all feel about the world around us? One day’s bad news may distract us from yesterday’s bad news – or last week’s. More often, I fear, the accumulation of stories has a “multiplier effect.” In short, did I just make it worse? Yep. Maybe so. I decided not to publish it on ConVivio. So, the resulting “Writer’s Block” (pictured here) has me looking for something else to think about and something else to write about. So, here is a quick start — just a start. Just little things. It’s brief. We’ll see if this approach leads anywhere. Caught on “smart doorbell” camera, kids return wallet with $700 inside. Small American town welcomes refugees with Southern Hospitality. There’s a new Alzheimer’s/dementia drug that’s showing promise in slowing memory loss in early clinical trials. A generous anonymous donor reveals her identity. She gave millions to artists without taking credit for the gifts. A British supermarker chain is introducing a “quieter hour” for autistic shoppers. An experiment with a four-day work week is a surprising success. Tourist accidentally pays 100 times taxi fare— driver tracks him down to return it. Riders of dirt bikes and all-terrain vehicles, illegal in most cities, have found a community. Recovering addict anonymously pays for ambulance crew’s breakfast. Surprising solution: saving a country from wildfires with goats. There’s a lake of liquid water on Mars. 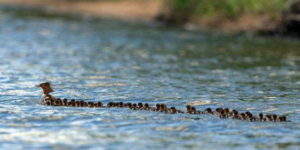 A mother duck is caring for 76 ducklings on Lake Bemidji in Minnesota. Your comments on this topic are welcome. Saturday, July 28th, 2018, by Daniel and is filed under "Ideas, Politics, Uncategorized ". You can leave a response here, or send a Trackback from your own site. Last Saturday, I drove to Northern California to spend time with Michelle’s children and we went to visit the golf instructor. I asked him how his little site was coming along, and he responded that he would get right on it. Bahahaha. I could tell you lots of great stories about my grandchildren, but I have a feeling that is not what you’re looking for. Let me keep working on this. I’m sure I will come up with something That will make the world a much better place. Wait for it. Wait for it. Wait for it. 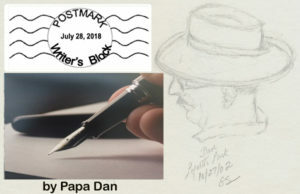 Thanks Dan – I needed a reset. I’d made a vow last year to only read the happy news in the NYT…that worked for a while, but I confess I fell into bad ways. We just returned from a cruise to Denmark and Norway. We had a wonderful time and one of the best perks of the trip was that we didn’t look at a newspaper, TV news broadcast or listen to any radio while we were gone. It was delightful. Thank you and Gretta for holding back on publishing the bad news and looking for the good. When I was down in the dumps an old friend of mine said to always think of one thing each day that I was most proud of. She said that most people are always so critical of themselves and need to work hard at thinking of the good things as there are many things to be proud of. Your message reminded me that I need to do more of that. 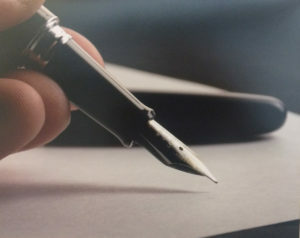 Good luck with your writers block and thanks for sharing as you inspired me to reconnect with the good stuff. Nancy, What a great thought! I have been amazed at the attention this little ConVivio piece has received. I;m glad you found it useful.